As we’ve learned, the art scene in New York City is varied, meaning it’s not restricted solely to institutions like the Metropolitan Museum of Art and the MoMa. We’ve covered everything from street art, subway art, to artist occupations and squats. The city has turned into an exhibition space and next on the list are corporate lobbies. While displaying works in corporate lobbies may seem like an afterthought in attempts to liven up the dreary atmosphere, many of them actually have quite a robust collection of art work, ranging from paintings to sculptures and installations. Here are 10 lobbies in Manhattan with artworks open completely to the public. So the next time you pass by one if these buildings, walk in and take a look. The IBM Building at 590 Madison Avenue has a few pieces of art in the lobby and the front ranging from paintings to sculptures, and even an accidental piece of art. It once even held a 3000 square foot satellite museum of the Whitney. 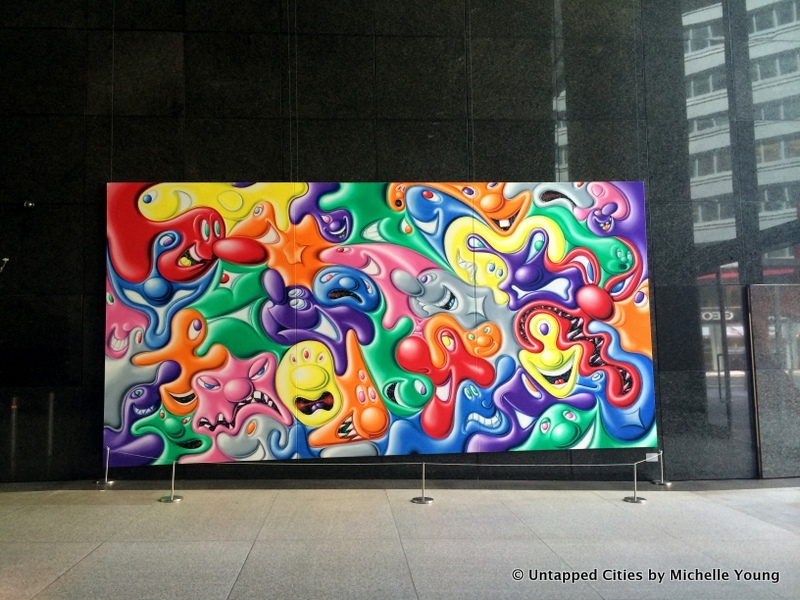 In the IBM lobby, there are works by Kenny Scharf, Robert Indiana, Andy Warhol, Jeff Koons, and Alexander Calder. Additionally, the atrium, a privately owned public space within the building often hosts art installations.